(CNN) -- Gunshots and explosions ring out. Soldiers, police and army trucks rumble through neighborhoods in the Thai capital; a plane flies overhead. Businesses are shuttered as barbed wire lines the streets. 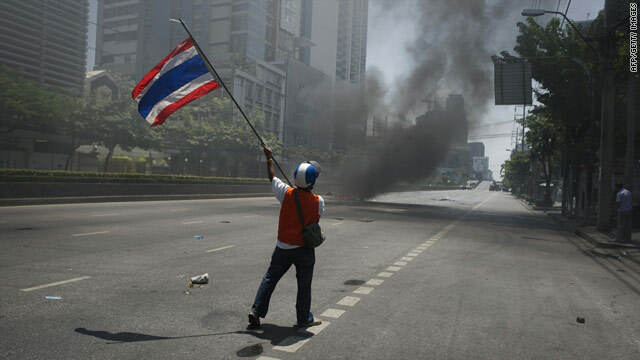 Such is the reality that some Bangkok residents say they now find themselves in after the authorities began moves last week to evict thousands of anti-government protesters, known as the Red Shirts, from a downtown district. At least 35 people have died since Thursday, including a key anti-government leader who was wounded by a sniper's bullet last week. "We cannot really go anywhere outside. We cannot go to the place that we like to go or used to go. We are actually living in a kind of fear, everyday," said Prajya Aura-ek, 25, a manager in charge of sales and marketing at his family's boutique hotel, which is located about three kilometers from the protest camp. "This morning I went out and walked around the Silom area with my camera, just taking photos ... but did not go far, just 200 meters, because last night there was a soldier who got shot right in front of our street," Aura-ek, who travels to work everyday despite the escalating violence, told CNN by telephone. "The fact that I have to drive here, you never know what you are going to run into. Are you going to run into a Red Shirt mob? Are you going to run into a police checkpoint or a soldier checkpoint? All the time I am staying at the hotel, you have to be aware of the news the whole time," he said, noting that their hotel had less than 10 percent occupancy --- down from a norm of 85 to 90 percent. The Dusit hotel was also closed for normal business, with most guests and staff evacuated, according to the global hotel chain's CEO Chanin Donavanik. Only some foreign journalists were still being accommodated there. "The hotel sustained some superficial damage to the exterior of the building in an unoccupied area," Donavanik said in a statement. "No one has been injured. We are extremely saddened by the escalating situation." Donavanik denied any suggestion that the hotel had been used for violent purposes. "We have not, and do not, condone the use of our premises for any act of violence and we can assure you that the reports of such activity from Dusit Thani Bangkok are completely false. "The matter is now under police investigation. As we have previously stated, we encourage all parties to end this situation peacefully as soon as possible, for the good of the people of Thailand." Another Bangkok resident, Nanta Tangudtaisak, a 26-year-old business development manager, said she stopped going to work on Thursday since her office was located in an area where the Red Shirts had set up camp the last few months. "Basically, I haven't gone out for the past four days. I have just been staying inside. Usually during the day, it's pretty calm in this area, there are a lot of soldiers... but at night you can hear a lot of gunshots," said Tangudtaisak, whose family home is near an intersection where the protesters have set up barricades. "I have hope that it's going to end soon. I have trust that the government will be able to stabilize the situation. What makes the situation complicated is that there are infiltrators in the Red Shirts that do have weapons," she said in a telephone interview. "You know it's kind of all of us being held hostage because of these infiltrators, that's why we can't go out of our homes." Palawi Bunnag, a 33-year-old attorney at the International Legal Counsellors Thailand, said she could hear gunfire, blasts and the sound of sirens from her office, which she said had to be evacuated on Friday afternoon because something --- it's not clear what --- happened to a building nearby. "We were quite scared because we did not know what was going to happen to our building," she said. "We cannot go anywhere but stay at home, which is the safest --- hopefully." Her parents and sisters were staying at home too: "They don't want to risk their lives going out there." Bunnag was working from home since the government made Monday and Tuesday public holidays to deal with the protesters. "I don't understand what is happening to our country right now," she said. "Everybody is suffering." Not everyone was troubled by the violence though. Canadian Jodi Ettenberg, who had to flee her apartment on Sunday since it was located in one of the city's "live-fire" zones (areas where the military and protesters have faced off), said some residents were more nonchalant. "On one end of the street people were eating as explosions were happening," she said. And Chayakarn Waiyakanee, who recently graduated from university, has not avoided the protest zone at all but gone straight to it -- to give food to the soldiers. "When I go there (protest areas) I'm so scared, because the situation is so strained. Everyone is Thai, and they're so angry. It's so sad." CNN's Kevin Drew contributed to this report.